For me, Silver Mine Cave was a disappointment. The tunnel is blocked off about twenty metres into the hillside. There’s a small hole in the concrete for bats to come and go, but people have been kept out for several decades. Graffiti covers the walls of the cave. The information board at the entrance is annoyingly vague. It says newspapers reported that silver was discovered there in 1862, and mined there in the 1880s. And that’s a pity, because the story of the silver mine of Silver Mine Bay is much more complicated than this suggests. The man behind the company was Ho Amei (1838–1901). Ho was an entrepreneur who thrived both in Imperial China and the British Empire – not only in Hong Kong, but in Australia and New Zealand too. He worked in the gold fields of Victoria in the 1850s, and later used his knowledge of modern mining techniques and entrepreneurial skills first to reopen an abandoned mine at Tamchow in Canton in 1884 and then to make it profitable again. Then Ho turned his attention to Lantau. 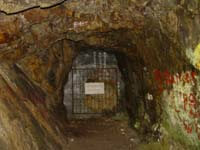 This article focusses on the size and scope of the mine at Mui Wo. By 1888, Ho’s engineers had driven at least four adits – horizontal tunnels – deep into the granite. The adits led to several winzes – vertical shafts inside the mine – that were 100 feet or 30 metres or more deep. A dam 2000 feet (600 metres) up on the hillside supplied hydraulic power to operate the mine’s pumps and lifts. The technology had only just been patented. The workings followed deposits of argentiferous galena – a mineral that mainly contains lead, but mixed with smaller amounts of silver. An aerial ropeway took the ore from the mine over rice fields and a hill to a smelting works near the seashore 3000 feet (900 metres) away on the north side of Silver Mine Bay. A British company, Messrs Robey & Co of Lincoln in eastern England, supplied the structure’s cast-iron columns, its roof and most of the machinery. The works were 240 feet long, and designed to process 40 tons of ore a day, not just from the Lantau mine, but also from the company’s other mine at Tamchow in Canton. After travelling on the aerial ropeway from the Mui Wo mine, the ore arrived on the upper level of the building. A 50-horsepower (37 kW) boiler drove three pairs of rollers, eight jiggers and a stone-breaker to crush the rock. Two buddles washed the ore as it descended to the ground floor along a trough. There four Frue vanners – large rubber belts that shook the ore and squirted it with water – separated the heavier particles containing metal from the lighter rock. Next came the furnaces. There were four Scotch hearths for refining lead, two reverberatory calcining furnaces, a reverberatory smelting furnace and an English cupelling furnace. A 30-hp (22 kW) boiler on the ground floor provided steam to various engines to operate the aerial ropeway, the vanners, a lift to the upper storey, and force air into the blast furnaces. The fumes must have been unpleasant to the point of danger, as the smelting works had a sixty-foot tall chimney. Flues took the exhaust gases to a condenser, and then to the chimney that was a further one hundred feet up on the hillside. The Belgian consul at Shanghai visited the mine in 1889 and said that there was even a small railway connecting the smelting works to a jetty on the north side of Silvermine Bay. The location of the smelting works is unclear. A line drawn on a map 3000 feet to the east of the silver mine ends at the modern village of Wang Tong (also known as Mang Tong). There is flat ground here close to the sea and next to the hillside. So the refining works might have been at this place roughly where the Mui Wo Holiday Inn and the Seaview Holiday Resort are today. But personally I think the building might have been a little further along the beach, on the lowermost part of the site of what is now the Silvermine Bay Outdoor Recreation Camp. (After all, 3000 feet is a conveniently vague number. The rules of arithmetic I was taught say that 3000 feet could have been as little as 2500 feet, or as much as 3499 feet.) There is a flat piece of ground approximately 300-foot long there, just before you get to Tung Wan Tau. The 240-foot long smelting works would have fitted in nicely. Furthermore, there is a stream from which water for the steam boilers could have been drawn. And most importantly, there is a group of rocks that stretch 30 to 50 metres southwards, and at right-angles to the shore, out to sea. That I think could be the remains of the jetty that brought in coal and ore from the other mine at Tamchow. I’ve looked at the rocks. There are several lumps of concrete, containing rusted metal among them. But nothing conclusive, I’m afraid. The chimney outlasted the mine by many years. US naval navigation manuals mentioned it as a landmark as late as 1938. This article was first published in the Indhhk email Newsletter 8 sent out on 19th August 2013. And posted as an article on the website on 12th July 2015. That is a fantastic article, thank you Andrew! I’ve looked but can’t find a part two – did you ever get around to figure out why the mine closed? Good to hear from you and glad you liked the article. I’m afraid there was no second part. However, I have a couple of more sources of information about the mine. I’ll try and sort these out into an article.